Competition: Hyper Japan tickets still up for grabs! Yakult is giving away free tickets to Hyper Japan 2012 Spring – Friday 24 February 2012 or Saturday 25 February 2012! From the 24-26 February Yakult’s friendly staff will be on hand at Hyper Japan 2012 Spring at Brompton Hall, in London’s Earls Court where they will be giving out free samples and chatting to visitors about the fascinating 75 year history behind the little bottle. Yakult was developed back in 1935 by the scientist Dr Shirota who isolated the unique Lactobacillus casei Shirota strain of unique bacteria. Today, each bottle of Yakult contains at least 6.5 billion live cells of this same strain, which help to maintain a healthy balance of bacteria in the digestive system. The show promises to be a fun filled day out, with attractions including Natsuko Aso Live, Games, Culture and all things Cool! Haikugirl’s Japan blog followers have the chance of attending this fantastic show for free on either Friday 24 February or Saturday 25 February as Yakult is giving away 5 pairs of tickets for each day. For the chance to win, all you need to do is answer the following question and email your answer headed ‘Yakult HGJ Competition – Friday’ or ‘Yakult HGJ Competition – Saturday’ with your name, address and contact details, to info@yakult.co.uk or send your answer and contact details on a stamped addressed envelope to ‘Yakult HGJ Competition – Friday’ or ‘Yakult HGJ Competition – Saturday’ at the address shown below. Q: What is the strain of unique bacteria found in Yakult called? For more information visit: www.yakult.co.uk. 1. Competition open to all UK and Ireland residents excepting employees of Yakult UK Ltd and Yakult Ireland; 2. No purchase necessary; 3. Closing date for receipt of entries is 19 February 2012; 4. The prize consists of a pair of tickets providing entry to the Hyper Japan Show 2012 and doesn’t include any other costs associated with the event; 5. The promoter reserves the right to substitute the prize for another prize of equal value without notice; 6. Prizes are non-transferable, non-negotiable and no cash alternatives will be offered; 7. The winners will be drawn randomly and notified on the 20 February 2012 and the tickets will be sent out to arrive on the 22 February 2012; 8. The promoter’s decision is final and no correspondence will be entered into; 9. If you do not wish to remain on the Yakult database please state so in your entry to the competition; 10. By entering, competitors agree to be bound by these terms and conditions. Promoter: Yakult UK Ltd., Artemis, Odyssey Business Park, West End Road, South Ruislip, Middlesex HA4 6QE. 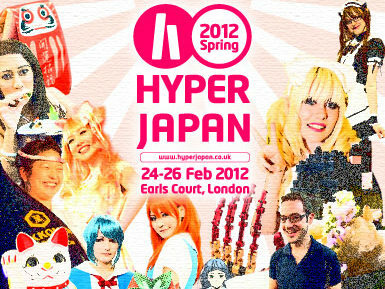 For more information about Hyper Japan 2012 Spring, or to buy tickets, click here! Just entered! 🙂 Sounds exciting! Thanks for posting this. I’ve entered for the Friday. In the morning, I’m going to the Tate Modern exhibition so I’m having a super Japan day.